Yesterday I kinased my SpecR PCR fragment, ligated it to the inverse-PCR fragment and transformed this into E. coli DH5alpha. But my transformations gave only the same tiny colonies as the negative controls (no-DNA and no-ligation). One of the positive controls (another AmpR SpecR plasmid made by the undergrad) gave thousands of AmpR and SpecR transformants, so I know that the competent cells (RbCl2-competent, frozen many years ago) and the antibiotic plates are fine. I wasn't totally surprised, because I already suspected that there was something wrong with the PCR amplification of the spec cassette. The PCR product looked right when I ran an aliquot of the PCR reaction in a gel, with a sharp band just smaller than 2 kb. But there was also a faint smear of smaller DNAs below this band, and after I had used a spin column to clean up the pCR reaction (should remove primers, enzyme and salts) the sharp band was smaller and blurry, and the DNA smear had become as second blurry band. The column cleanup of the inverse-PCR fragment gave a nice sharp band of the right size, so I don't think the problem was with the column treatment. This was cause for concern, so I repeated the spec PCR, thinking that maybe I had screwed up (why would a cleaner band be smaller and blurrier?). But I got the same result. I again used the student's primers and template chromosomal DNA, but I lowered the annealing temperature for the first two cycles because the 5' 12 bp of each primer are not complementary to the template DNA. Before cleanup the amplification product looked the same as before (red arrow in left gel) - a sharp band with a faint smear below it (the smear doesn't show up in the photo). After cleanup it again turned into a slightly smaller blurry band with a second blurry band below it (two red arrows in the right gel). 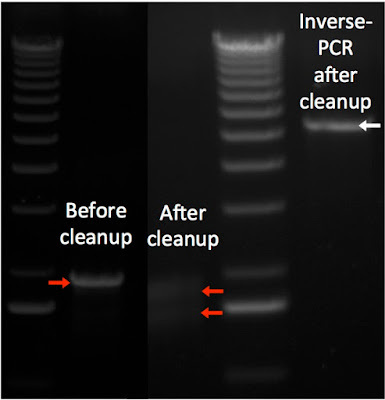 The larger sharp band indicated by the white arrow is the inverse-PCR fragment after identical cleanup. I have no idea what could cause the SpecR PCR fragment to behave like this. Before I dig into it I should check that the cloning failure was not instead caused by a failure of the kinase or ligation reactions. Test for kinase and ligation: I'm taking the inverse-PCR fragment, and kinasing and ligating it. This should produce a simple plasmid with the antitoxin gene deleted. I'll transform this into DH5alpha, selecting for AmpR. (Again no-DNA control and p∆AT:spec control.) If I get lots of transformants then the problem is the Spec PCR fragment. If I get none then the problem is the kinase or ligase reaction. I was hoping to use singly-cut p∆AT:spec as a ligation control, but neither SacII nor HincII appear to cut where they should, so I'm doing without this control.